Barton was historically part of both Barton St Michael’s and Barton St Mary’s parishes. Now only the tower of St. Michael’s remains but it was built by the mid C12, and closed in 1940. St Mary de Lode has its origins pre-conquest. Around AD767 the royal manor of King’s Barton was recorded as an estate to supply food and administrative services to the King who used the palace in Kingsholm. Eldred the underking of the Hwicce granted land for the manor. In 1066 there were 12 ploughteams on King’s Barton manor, but by 1086 there were 22 teams. Between 1086 and 1327 trades in Barton Street included iron working, cloth making and leather. By the 1260s the Abbey had 10 houses in Brook Street, now Station Road, which led out of the north east corner of the town walls along the southern branch of the Twyver to Morin’s Mill – named after Roger Morin, the owner in the C13. In 1269 Brook Street to London Road was filled with the Carmelite Friary grounds and buildings. Settlement occurred on outer Barton Street during the C13 as the Fokett family owned land there. In 1273 people were recorded selling outside the town walls to avoid paying tax. A man living in Barton Street was said to intercept and buy leather. The Eastgate or Ailesgate was the Jewish quarter until 1275. It was the least favoured route out of the city. It ran to the two bartons and then to the small market town of Painswick. During the later Middle Ages it became a more popular route out of Gloucester with the development of the Stroud Valleys clothmaking industry. In 1370 Barton Street was a hamlet outside the borough boundary. Gloucester became a city in 1541. In 1612 Alderman Lawrence Wilshire lived in a house in Goose Lane (later Millbrook Street), later known as Lower Barton house. It was demolished in the 1880s. In 1653 a nursery of fruit trees is recorded on Barton Street. In 1658 World’s End was marked along Barton Street and divided into three dwellings. One of these was the Red Lion Inn in 1780. In 1678 Daniel Lysons gave £16 to provide bread for the poor of Barton Street. In 1643 67 houses were destroyed in the inner city Barton Street area prior to the Civil War siege. The town clerk, John Dorney, said the city became ‘as a garment without skirts, which we were willing to part with all, lest our enemies should sit upon them’. Market gardening grew in Barton Street. In the 1670s William Bennett was growing beans, carrots and onions, and possibly manuring his ground with night soil from the city. Records of the 1672 Hearth tax show that only 2.2% people were paying the higher tax rate in Barton Street, compared to 17.2% in the cathedral area. By 1700 most trading was happening in inns and alehouses and the open markets in the city went into decline. Some development occurred along Barton Street by 1736, when houses were advertised as being advantageous for tradesmen. In 1741 Woodchester clothier Benjamin Gegg operated new fulling and napping mills in Barton Street but seems to have failed as there is no further mention of this. By 1749 physician Charles Greville had a large house and garden called Elton house; the gardens had summer houses, arbours and a central obelisk on a mount. In 1763 a permanent theatre was set up in Barton Street. Samuel Ryley, its manager in 1784, called it ‘a melancholy inconvenient place, which when filled, would not hold more than £35’. More building led to the moving of the turnpike out to the junction with Barton Lane in 1779. The India House, later the India Inn, is first recorded in 1780. By 1782 a dyehouse was operating at Morin’s mill on Brook Street. In 1799 Chequers Inn was built and cottages on Mop Lane (later Upton Street) recorded. In 1803 31 of the 68 paupers registered in the City lived in Barton Street. In the C19 barrister and banker William Fendall built a large bow fronted mansion in inner Barton Street. A building at the junction by India House inn was owned by Thomas Smith a timber merchant by 1820, and he began the development of Barton Terrace, later Tredworth High Street. Between 1821 and 1831 107 new houses were built in the hamlets of Barton St Michael and Barton St Mary outside the city boundary. In 1821 two rows of houses called Foley Place and Foley Cottages were built at the junction with Park Road. The Gothic Cottages, built before 1822, were used as an isolation hospital during the cholera epidemic of 1832. At this time, to go beyond the junction with Park Road was regarded as ‘going into the country’. But in 1832 the Parliamentary borough was enlarged to include more of Barton Street. Sewers and drainage didn’t meet the rapid growth of housing, so in 1835 health boards were set up, without much effect. Clarence Street was built in the 1830s and Victoria Street laid out in 1837. The first narrow gauge railway came from Birmingham in 1840, and the first station opened east of the cattle market. Hampden Place off Barton Street built as a cul-de-sac in the 1840s, when Foley Cottages and Foley Place were demolished to make room for a branch line to High Orchard and the Docks. Corn merchant Joseph Sturge built houses for his workers on Falkner Street in 1850. Development continued on Barton Terrace (later Tredworth High Street). Melbourne Street and area became known as California and was described in 1871 as ‘a strange mixture of neat villas, fragrant pigsties, and Newtown shanties’. The area known as Newtown then contained mostly huts inhabited by the poor who had been evicted from High Orchard. This community sprang up around a pipe factory in the 1830s. The huts were removed by 1891. Building near Old Farm on Barton Lane (later Parkend Road), and two cottages built as part of an allotment scheme, occurred in 1850. The Tuffley loop was installed in 1854. In the same year AGD Goodyere, owner of Barton house, laid out several streets including Widden Street, where Gloucester’s first board school was built in 1878. By 1863 the Vauxhall gardens were covered in terraced housing and a terrace had already been built to face the gardens from Millbrook Street. By 1869 a wagon repair works adjoined Lower Barton house, the owner of which built the houses in Sidney Street. Joseph Lovegrove bought Barton house in 1870 and started a small development south of the road. In 1873 a medical officer was appointed for the city to try to ensure that houses had a clean supply of water, but as late as 1892 there were houses that still hadn’t been connected. In 1874 all of the Barton Street and Tredworth area came under the city jurisdiction, and the health boards disbanded. New sewers were laid in 1876, but it took until 1885 to get all the houses connected up. In this period there was rapid expansion with lots of development in Barton Street and Tredworth, because it had become less fashionable to live there. In 1885 Lower Barton house was demolished and Derby Road and other streets were laid out in its grounds. The Co-operative Society built a depot at the east end of India Road in 1887. Repairs were undertaken on the slum dwellings in Barton Street in 1894. 1801 – 697 in 136 houses, so an average of 5 people per house in the Barton Street area. 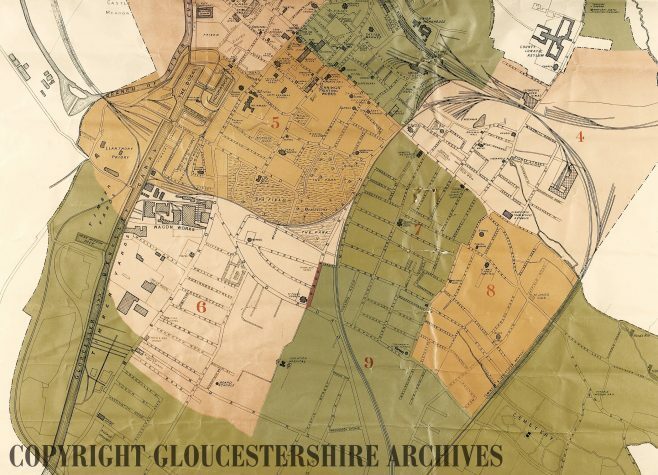 1831 – 11,933 – for Gloucester city as a whole. Regular entertainment was at the pleasure fair held alongside Barton Fair. It drew large crowds and survived several attempts to suppress it on the grounds of danger to public order and morality. Roller skating rinks opened in a former tramways depot in India Road in 1909. 6 cinemas existed in Gloucester in 1935, but two in Barton Street subsequently became bingo halls, including what is now the Picturedrome, which was converted in 1985 to a theatre by the Gloucestershire Operatic and Dramatic Society. In 1465 An annual fair was established in Barton Street by the abbot of Gloucester Abbey to provide a more official venue for extramural trading. It was to be held on the eve, day and morrow of St. Lambert (the 16th – 18th of September). By 1586 it was predominantly a pig and pleasure fair attracting many pedlars, gypsies and travelling showmen. At the start of the Civil War in 1641 Barton Fair continued in private ownership in September. Corn grown in Herefordshire was a main commodity and it then got shipped to Bristol, whose population doubled between 1670 and 1730. Malt and cheese were other important commodities. In fact Barton Fair became famous for its cheese which was carted to Lechlade and Cricklade and shipped down to London. In 1752 the Fair was held on 28 September. In 1756 two mop or hiring fairs were held on the following two Mondays. In the 1780s Barton Fair’s importance for cheese went into decline, although three cheesemongers were still employed in the city in 1791. In 1808 mop fairs were held on the three Mondays subsequent to Barton Fair. In the 1920s Barton Fair attracted buyers from Wales for the sheep. Begun in 1837 and consecrated in 1841, it was built by subscription. The house for the curate was built in Upton Street in 1854 and was demolished in the 1980s when a new vicarage and other houses were built on the site. The church is designed in a late C13 style. It is a single cell building with a north gallery, porch and bell cot. In 1879 a chancel with east vestry and an east aisle with a wooden bay were added. The Gallery was enlarged and rooms created underneath in 1979. In 1813 seven Baptists worshipped in a room in New Inn Lane. They began a mission to Barton end and by 1824 there was a congregation of over 200. In 1823 the Baptist minister built a small school-chapel in Back Barton terrace (later Albany Street). The school was replaced by a new room in Barton Terrace (later north part of Tredworth High Street) in 1840. Historically they were very active in the Barton and Tredworth areas. In 1827 a Sunday School was opened at Barton End, and in 1837 the Minister registered a house in Barton Terrace. A schoolroom was built in Victoria Street in 1847, which was sold and converted to two dwellings in 1864. The school building was sold in 1957 and the front demolished. In 1851 Wesleyan Reformers moved to Ryecroft Street. In 1858 they built a chapel on the High Street which was acquired by the Anglicans in 1866 and used until the mid C20. By 1870 the Ryecroft Street chapel had become too small, so a larger one was built on the corner of Falkner Street. In 1876 a house on Falkner Street was bought for the minister. The Chapel closed in 1955 and the congregation moved to St. Luke’s on Stroud Road. In 1876 Wesleyan Methodists moved back to Newtown and opened a mission room in Tredworth Road that was used until 1883. They held open air and cottage services in Barton Street. In 1856 they used two rooms on Ryecroft Street, but in 1859 they moved to Lower Barton Street. In 1869 the seating in the chapel increased, witn an average attendance now around 130. The Chapel was sold in 1882 and a larger one built on the other side of the road which also had a classroom. Membership declined by the 1960s, and was down to 44 in 1980. In 1879 another chapel was built on Melbourne Street. In 1895 an iron schoolroom was replaced in brick. In 1966 it was sold to the Church of God of Prophecy. Jews were first recorded in Gloucester living in the Eastgate area in 1168. In 1275 they were removed from Gloucester to Bristol on the orders of Queen Eleanor. However, in 1764 Jews reappeared in Gloucester as jewellers, silversmiths, shopkeepers and pawnbrokers. A Jewish burial ground opened on Barton Street in 1785, and in 1792 a synagogue was built on the Street nearly opposite the Unitarian Chapel. By the 1850s Gloucester Jews were using Cheltenham Synagogue. There has been a Muslim community in Gloucester since the 1950s. In 1968 two houses in Ryecroft Street were registered for use as a prayer hall. The houses were demolished in 1981 and a larger mosque built, designed by local architect Brian Tait. The new mosque opened in 1983. St. James’ school opened in 1844 and cost £2345. The government gave £565, the National Society gave £400 and the rest was raised locally. It had a girls, boys and infants department and was built to school 486 children. In 1984 there were 103 pupils on the roll. Tredworth School opened in 1887. In 1904 there were 770 pupils on the roll. The infants department moved to Victory Road in 1970. Hatherley School opened in 1901 and was built to school 890 pupils. In 1904 there were 803 on the roll, in 1915 there were 1028, in 1938 there were 724, and by 1984 just 92 pupils were in attendance. A voluntary school called Alington was opened on Millbrook Street in 1869 but it had closed again by 1878. The Wesleyan school on Victoria Street moved to Ryecroft Street in 1871. In 1904 there were 410 pupils but it had closed by 1908. In the 1820s India Road mill was used as a grinding house by Cox and Buchanan. In the C19 it was used as a corn mill known as Brown’s Mill. This ceased trading in 1910. Goosewhite or Whitegoose mill (later Millbrook Street) was used as a snuff mill in 1790. Pin makers Hall and Lander used it as a wire mill in 1813. It was demolished in 1865. Morin’s mill on Brook Street (later Station Road) was held in the C13 by Roger Morin. In 1782 it was used as a dyeworks, and in the 1850s it was a sawmill. It was later taken for railway development.